First I want to apologize for any typographical errors. The internet connection is so slow here in Aguatyia, Peru that selecting a word and modifying it takes well over 6 seconds. The keyboard is so filled with dust that keys often fail to respond or fail to recoil after being pressed. As physical therapists we often ask our patients how they sleep. We are interested in the effect of their pain on their sleep as well as the effect of their sleeping position on their pain. Disturbed sleep leads to a cascade of negative effects from cognitive impairment, depressed immunity, and increased pain sensitivity. 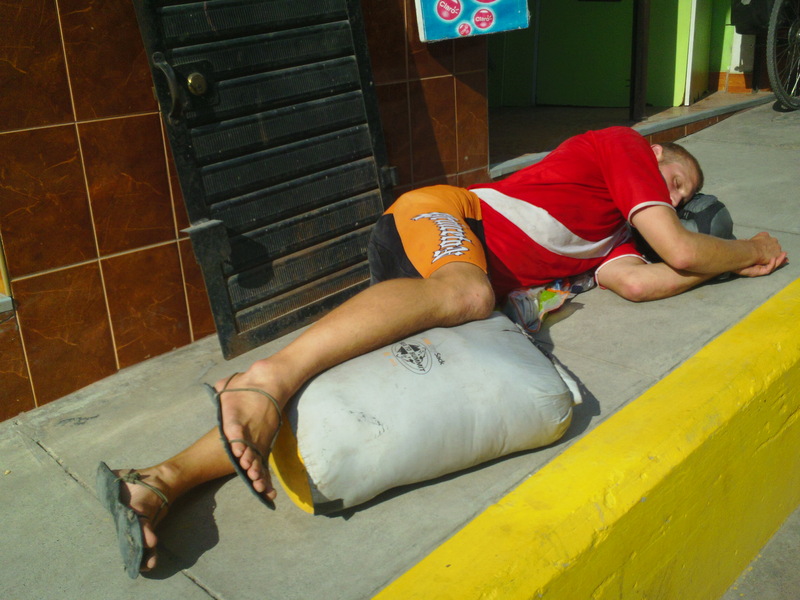 I´ve been observing sleeping positions and environments during my travels down the Napo and Ucayali rivers in the Amazon, and asking people how they are sleeping. My first observation is that the people I encountered in rural farmsteads sleep 8 to 10 hours per night. Going to sleep between 7 and 9pm and waking between 5 and 6 am. Travelers on the riverboat slept even more. Keeping roughly the same evening hours with the addition of 3-4 hours of napping throughout the day. In the farmhouses along the river, nobody slept in hammocks. Some slept on thin foam mattresses while most slept on the wooden floor covered with several thick blankets. A diminutive pillow consisting of a folded towel or blanket completed the arrangement. I observed all sleeping positions: supine, sidelying, and semi prone, with supine being slightly more common than the others. Most families slept adjacent to each other under the same mosquito net but rarely in direct contact. Everyone in the farmhouses I asked said they slept through the night and I did not hear any tossing and turning when I slept nearby. This was surprising to me , as I found sleeping on a surface as firm as a blanket on a wood floor rather uncomfortable. With a few simple props though, I am now able to sleep well on hard surfaces. In my personal experience, discomfort generally arises from one of two sources: loss of neutral alignment of spine (straight back) or pressure on bony protuberences. People have different tolerance levels to a non neutral spine position and body fatness can go a long way to cushion the bony parts. Since I have a rather low tolerance to non-neutral alignment and insufficient natural cushioning, I have devised other solutions to the discomforts I feel when trying to sleep on hard surfaces using readily available props (typically extra clothes from my luggage). Problems: my lower back aches, and eventually my heels and back of head ache as well. Solutions: Small folded shirt under my lower back and larger folded clothes under my calves to take pressure off my heels. A thin folded cloth under my head and neck. Solutions: prop under the neck that brings the head into netural alignment, folded clothes under the side and if available, something between my thighs. Problems: same problems as sidelying with the addition of neck rotation. Solutions: The hardest to compensate for as it requires the most props. Use all props of sidelying with the addition of a prop supporting the upper side which extends the length of the body. What about the hammock? I am able to sleep in a hammock comfortably with a neutral spine by attaching the ropes far apart to make a shallow curvature and by putting a large bundle of clothes under my low back. On the riverboat to Pucallpa, the hammocks were all hung at very steep angles because the provided attachment points were placed very close together. The result is a hammock position suitable for sitting upright. Sleeping is possible if you are very short and have enough space to sleep diagonal in the hammock. 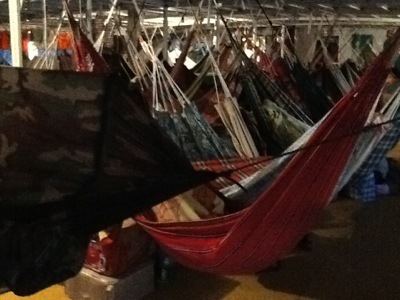 The overcrowding problem was especially acute for those who hammocks were hung in the hallway and for those who were sleeping on the floor of the hallway. I found it impossible to make it to the bathroom without bumping or stepping on several people along the way, there simply was no getting around it. Why these people didn´t tie their hammocks in the center of the boat and out of the hallway is beyond me. I would rather be packed in tight in the middle than constantly being stepped on. 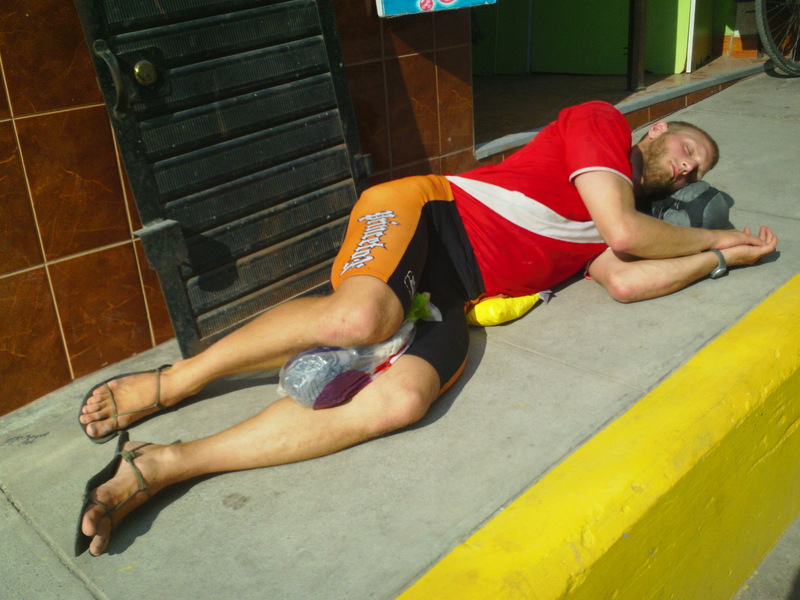 One of the men who was sleeping in the hallway said ¨´traveling is always a little uncomfortable.” This struck me as a fatalistic, and typical response to discomfort of the people of this area. Your observations on posture and movement in South America remind me of sights I saw in India many years ago. Fascinating!